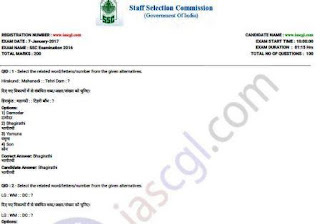 SSC CHSL 2016 All Question Paper in Single PDF File. Staff Selection Commission release Notification for CHSL 2017 Exam. Candidates wants to know exam pattern and question type. This PDF, we're sharing will help candidates in all what they are looking for. It contain all Question Paper of CHSL 2016 Tier I exam. Candidate can download this PDF from the Link Given Below.